When it comes to exploring Europe, it really pays off to start at some of the most popular capital cities. From Paris to Rome, Madrid and Berlin, you could spend years exploring these vibrant cities. 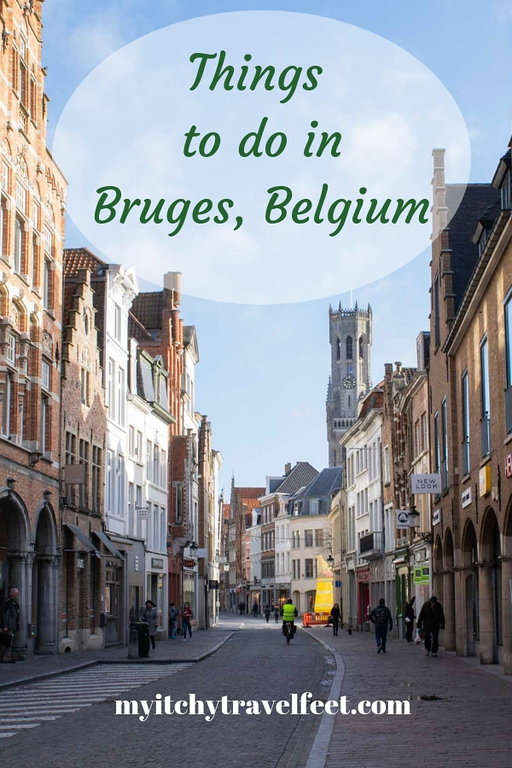 However, if you really want to head to a place that whose old-world charm is just as fascinating, but manages to evade the tourist glut, get yourself to Bruges, Belgium. With winding canals and enchanting architecture, you’re sure to feel as if you’ve just stepped into a fairy tale. 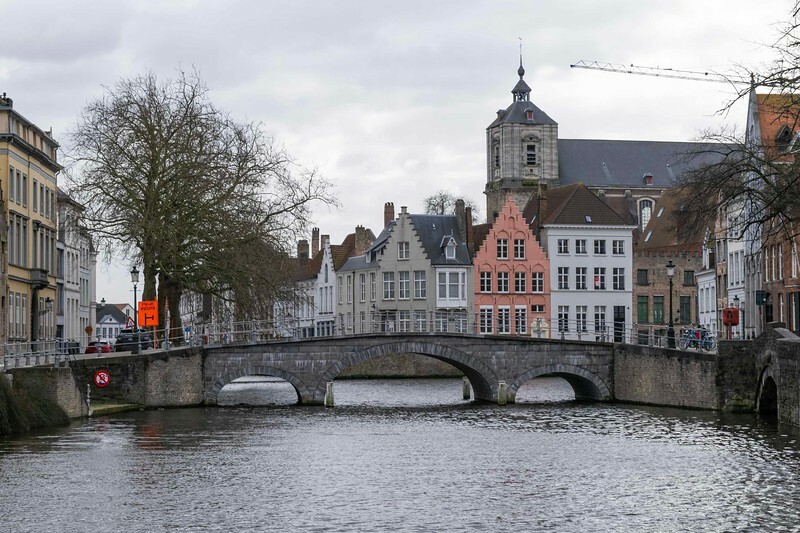 Guest contributor David Johnston from Travelsewhere, is here to tell us the best things to do in Bruges for the boomer traveler. Ask people where’s the prettiest place in Belgium and I guarantee many will say the city of Bruges. And they’re not being generous either, Bruges is rightly one of Belgium’s most picture perfect cities. Horse-drawn carriages create a old-world charm to the city center. No wonder then that this small city in West Flanders is on the itinerary of most visitors. Whether as a day trip or an overnight stay, visiting Bruges takes you to a place of charming history, serene canals and indulgent beer and chocolate. What’s not to like! I’ll take a city with canals any day! 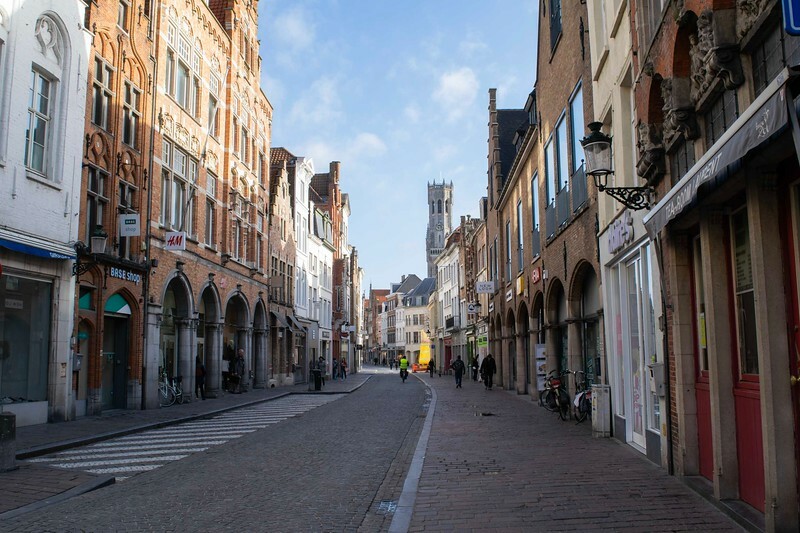 One of Bruges’ great strengths is that it should appeal to people of all ages, with something for everyone. Yes, much of the city’s attractions tie back to the history of this medieval powerhouse of trade and its enchanting canals that made it possible. So even if you aren’t up to endlessly walking around this pleasant UNESCO city, you can watch the scenery go by from the back of a carriage or boat. (Book carriage rides here.) Ultimately an easy place to navigate about, armed with this guide you should have no problem exploring Bruges independently. 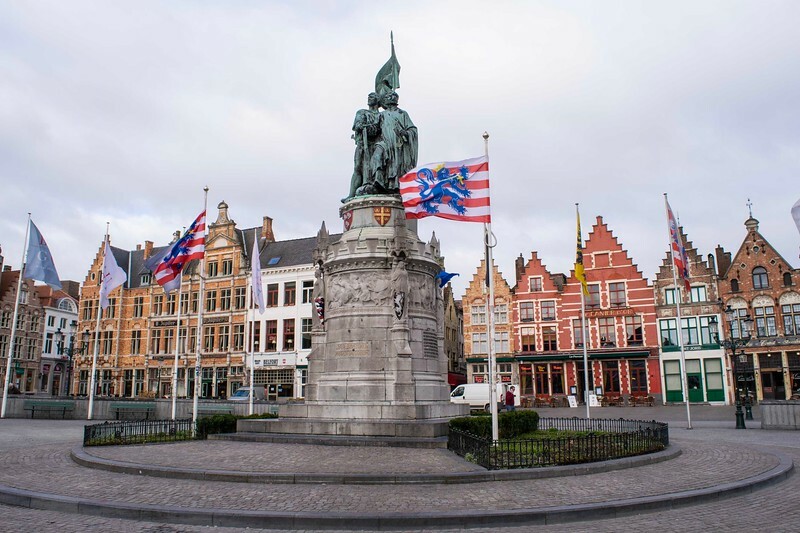 The statues of Jan Breydel and Pieter de Coninck, who led the uprising against violent uprising against Philip the Fair, hold court in the Markt. 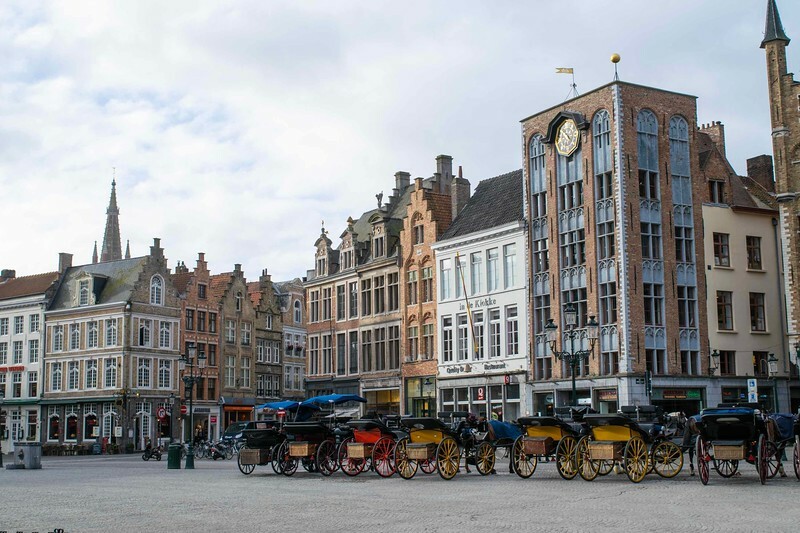 As a starting point to your visit, there’s no better spot than the Markt, Bruges’ central market place square. By coming here first, you’re treated to many of the city’s most iconic landmarks. Really, no matter which direction you turn on this square you’re going to find buildings that showcase the Gothic splendor of Bruges. 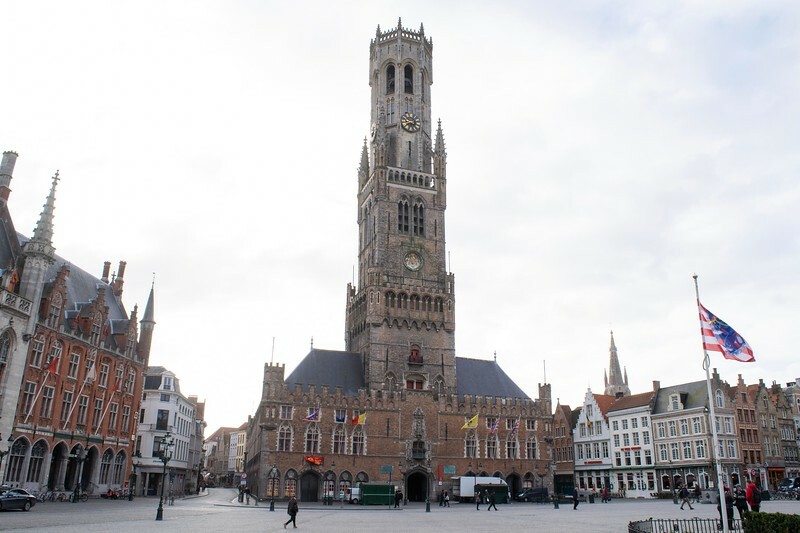 The Belfry of Bruges is one of the city’s most famous landmarks. While Bruges’ Provincial Court would be the main attraction on most other squares, here that honor goes to the Belfry of Bruges. This giant medieval bell tower emerges from a rather squat building, lending the belfry a rather unusual look. It’s still an enchanting piece of architecture, just a little different. Besides the belfry and great, grey Provincial Court, the rest of the square is lined with undeniably pretty buildings. They really make a colorful backdrop for the statue to freedom fighters Jan Breydel and Pieter de Coninck. Don’t miss a stroll by the beautiful gilded Brugse Vrije. Just a short walk away on the other side of the city’s Provincial Court you find yourself in the equally delightful Burg Square. While much of this large square is a tree-lined park, it’s the buildings at its other end that are its big draw. Although the statuesque Town Hall takes pride of place here, it’s a little hard not to be distracted by its neighbors either side. 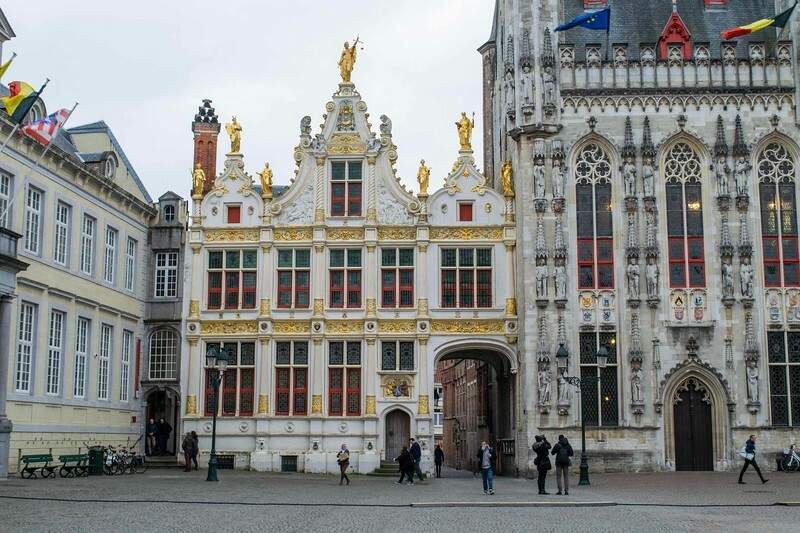 On one side of the Town Hall you’ll find the elegantly gilded Brugse Vrije, a former Baroque courthouse and current art museum. Its opposite number is the Basilica of the Holy Blood whose golden statuettes also steal your attention. More than a facade though, this basilica is named after its supposed relic – a cloth stained with Christ’s blood. Even if you don’t attend a service or visit the treasury here, it’s worth visiting the basilica for its bold and lavish interior. A canal boat ride is a must to get a feel for the city’s beautiful architecture. Of course, if you come to Bruges, there’s a good chance that you want to go on the obligatory canal boat ride. First, it’s useful to understand the layout of Bruges’ canals. Immediately circling the town centre are the inner canals, passing under small bridges and into short tunnels. From here are some arterial canals that link to the greater outer canal ring and the straight-as-an-arrow Damse Vaart. While the canal cruise is the most popular approach, it’s also possible to walk or cycle about to explore the Bruges canals. The standard Bruges canal ride lasts 30 minutes, leaving from Rozenhoedkaai and mostly sticking to the inner canals. 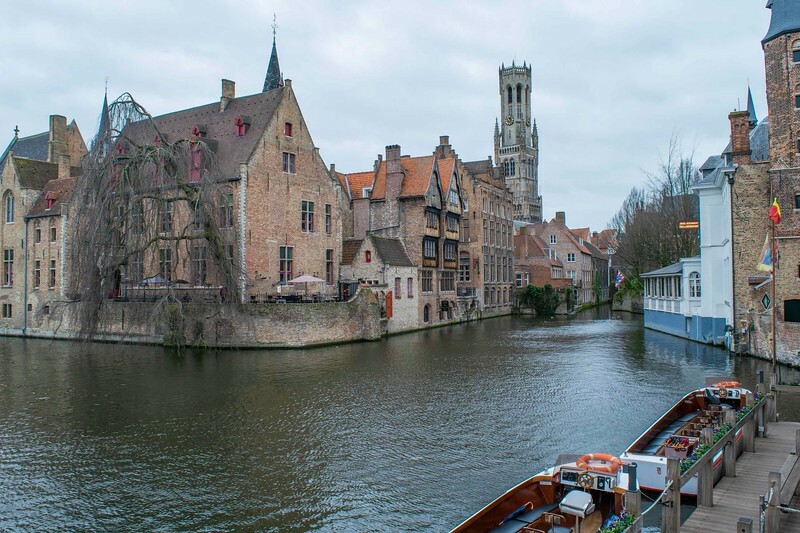 Down on the water, the canal cruise allows you to see Bruges from a completely new angle and relax as the city drifts by. Fair warning, this is the most popular activity in Bruges and the wait will only get worse the further past 10am it gets. Unfortunately, the canal ride only seems to run from March to mid-November, as visiting Bruges in winter isn’t such a bad thing in my opinion. This is one of those charming little spots that is just made for photos! In a city of pretty scenery, it could be tough settling on Bruges’ prettiest spot. Is it the view of the Bruges buildings over the canals at Rozenhoedkaai? Is it the Koeleweimolen windmill way out near the Damse Vaart? While both are picturesque, I’d argue they both come second to the Bonifacius Bridge. 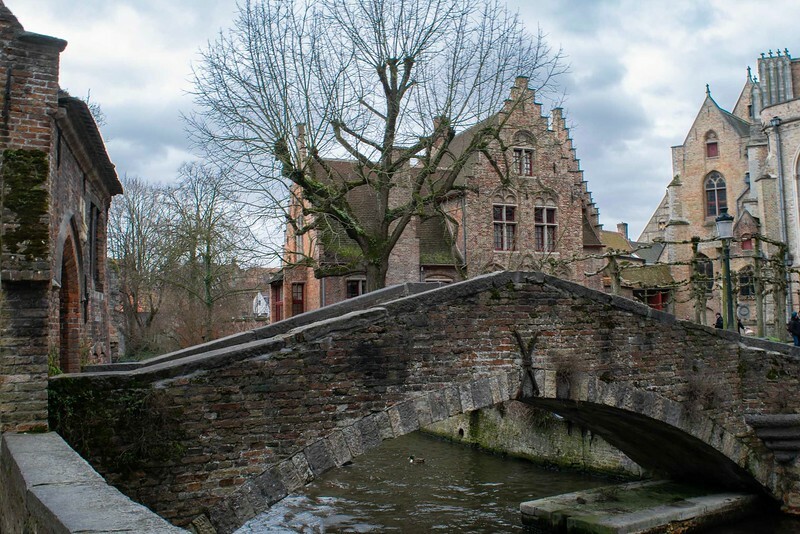 This romantic little brick bridge sits in a nook between the Arentshof courtyard and the grounds behind the Church of Our Lady Bruges and is a spot you’ll sure want your camera for. The streets of Bruges makes you feel like you’re walking in a fairy tale scene. No matter which historic city centre you’re in, one of the best things to do has to be wandering the Old Town streets. Bruges is no exception. Whether it’s by the canals or descending into the medieval maze, not knowing what you might find is undoubtedly fun. If you’re looking for a general landmark to meander towards, seek out Jan Van Eyck Square or the Arentshof. Honestly, you can’t go wrong somewhere like Bruges. Sint-Janshospitaal is a great place to see some of the city’s best artwork. Bruges is home to any number of churches and museums that you can spend time, learning about the city’s history and culture. You could surely spend an entire day just exploring these landmarks and attractions if you wanted. But if you’re short on time or money, then perhaps choose one of each to visit. Inspired to explore this beautiful city? Start your search for hotels in Bruges with us. For a church, consider the Church of Our Lady Bruges where you’ll find various works of art, including Michelangelo’s sculpture of Madonna and Child. 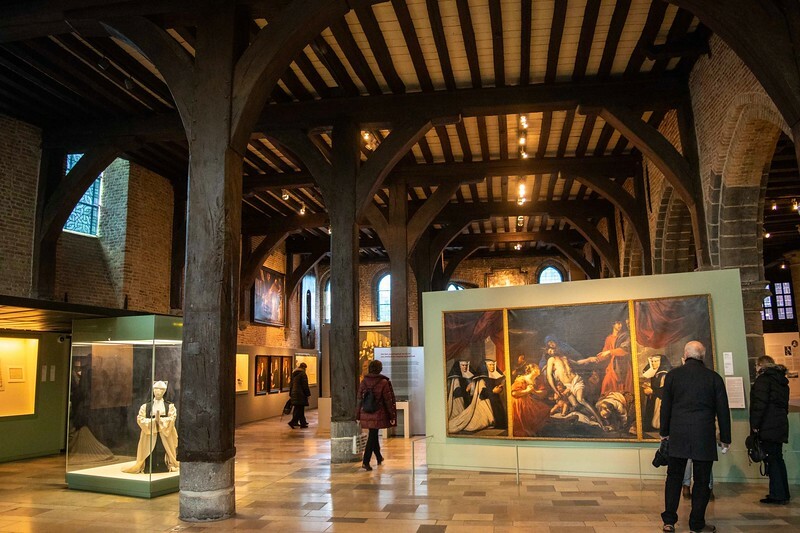 As for museums, a close by choice is the Sint-Janshospitaal, where inside this 11th century hospital you’ll find exhibits on the hospital, period medical equipment, as well as artwork from Hans Memling who lived in Bruges. The city’s beautiful architecture never stops no matter what neighborhood you visit! While there are various shops throughout the city, the quaint streets around Walplein Square are something else entirely. These gumdrop houses are where you’ll find much of the city’s artisanal and handmade wares, especially related to textiles and confectionery. Besides these stores, the streets off Walplein offer plenty of restaurants, cafes and bars, meaning it’s a perfect place to stop for a spell. 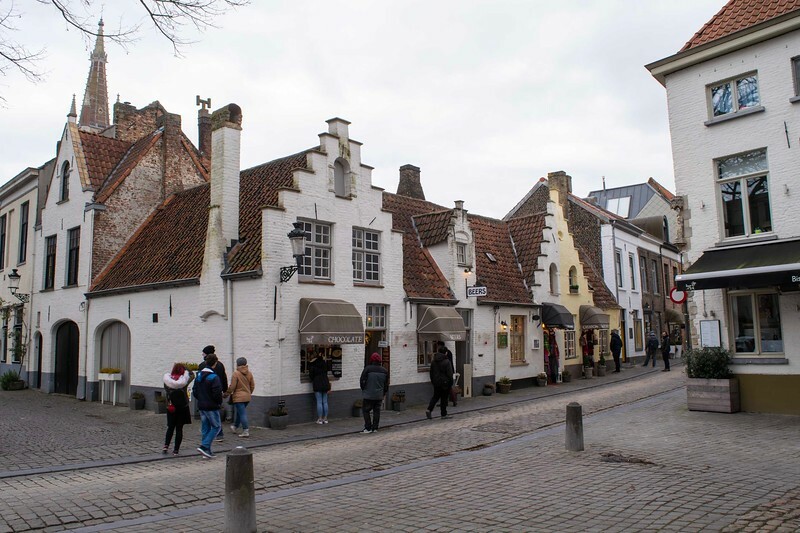 Those who have visited other Belgian cities may be familiar with the concept of beguinages, as they’re very specific to this pocket of Europe. 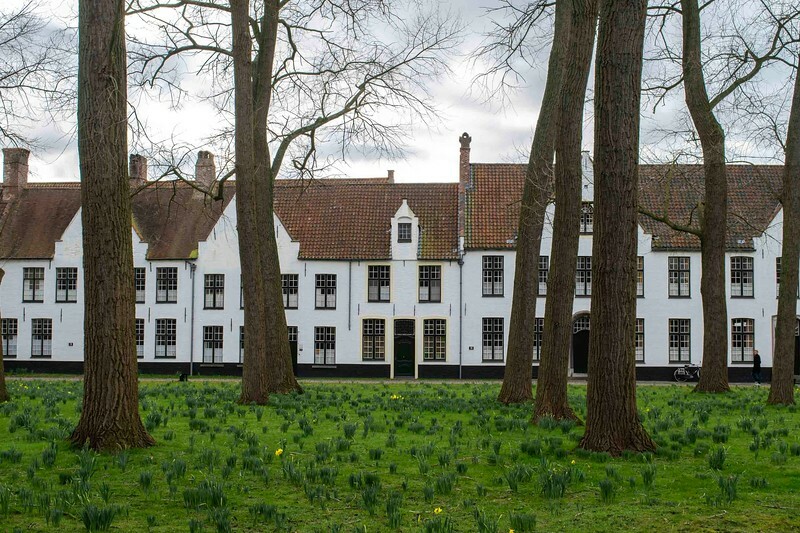 Essentially, beguinages were a housing community that attracted women like widows and the unmarried who were religious but didn’t wish to join a convent. 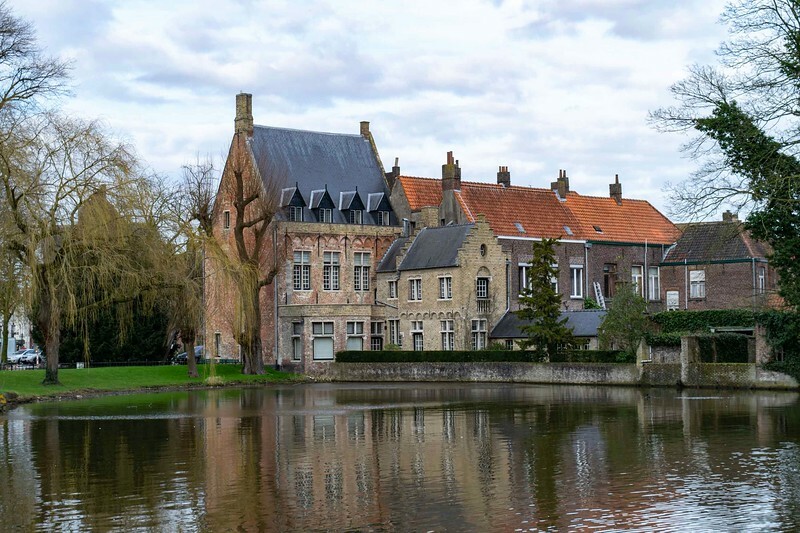 Often defined by very humble houses, the beguinages that have survived to this day bare a very different look to the rest of a city, making them a fascinating place to visit. And it’s safe to say, that the Bruges Beguinage (or Begijnhof in Dutch) is one of Belgium’s most photographed. With its simple white brick houses around the small park at its centre, the Bruges Beguinage holds an atmosphere all its own. Minnewater is perfect for a leisurely stroll. One last spot worth visiting before you put your feet up are the sights around the Minnewater. Sitting just outside the Bruges Begijnhof, this waterfront park area is simply stunning and dotted with landmarks. There’s the idyllic Sashuis, the scenic Minnewaterbrug bridge and Poertoren tower at its end. Just when you thought you’d seen all Bruges highlights, there comes this wonderful little spot and a great way to finish on a high note. While you’re in Belgium, don’t miss our tips on a self-guided walking Antwerp walking tour or how to go off-the-beaten-path in Brussels. David is an avid traveller from Australia who has spent the last three years exploring as much of Europe as he can. He has a passion for trying to find the lesser-seen, quieter pockets of the world, fostering a love of photography along the way. Follow his travels elsewhere through his travel blog Travelsewhere and on Facebook.